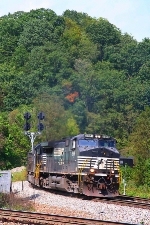 Description: A Norfolk Southern train meet, with a NS stack train sliding through the crossing. Description: Parked on Junland Siding at the left with UP 9293 leading is UP Train MLIAS 08 while the one on the right with NS 8981 leading UP Train QDYAS 08 blasts by at 57 mph. Description: Westbound on track one passing CP 88 as he slows for the yard. Description: An Alabama bound coal train gets some help from an Oakway. Title: CN 2698/NS8981 SB At Ash St. Description: 17th Ave., 0711 hours. Description: A former Conrail C40-8 still in Conrail colors in the Croxton New Yard. Description: NS 39G awaiting the C759 to clear the Delair Branch. Description: NS 39G with D9-40CW 8981 & 8-40C 8308, still in Conrail paint. Description: NS C40-9W 8981 leads 223 (Kansas City Mo. to Atlanta Ga.) through Bowen.